At precisely dawn on November 1 I was bringing my Christmas tree out and queueing up Tony Bennett’s The Classic Christmas Album. I had my spicy hand soap swapped into my bathroom in place of my seasonless coconut variety, and stocked my fridge with early holiday essentials. Here are few favorite finds that are fueling my festive feels (how’s that for an alliteration). Listen… I know leading things off with poo pourri is a weird suggestion, but I’m so into it. Just spritz it in the bowl and let the good times roll. Smells like cinnamon, vanilla, and citrus. The name is hilarious, the scent is lovely. Get it. Another bathroom essential for the season: this straight up smells like Santa Claus. Like a spicy, woodsy, Christmassy cologne. It’s bright Christmas red, adorned with jingle bells, and will give you a dose of the holiday spirit every time you’re in the bathroom. Y’all already know how obsessed I am with David’s Tea, and it hasn’t slowed down. How could it? 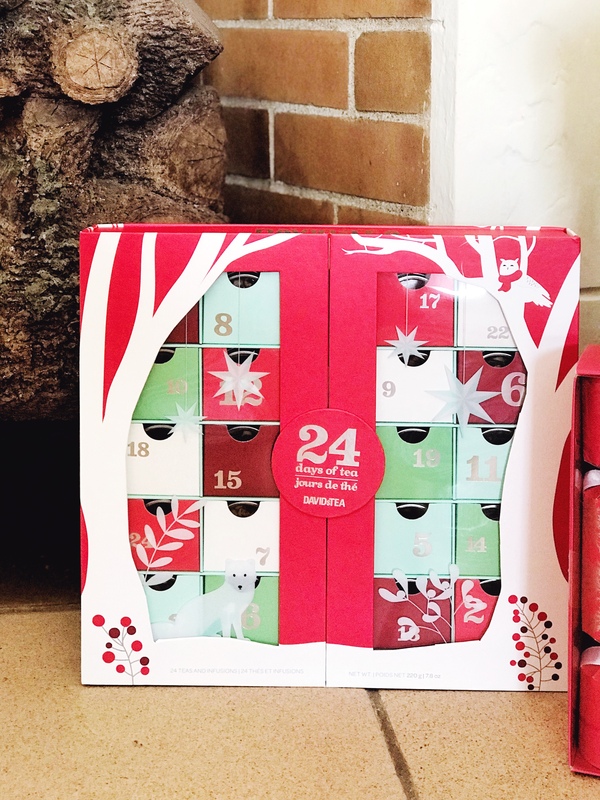 Just LOOK AT THIS ADVENT CALENDAR! You can have a different festive holiday tea EVERY DAY. From Candy Cane Crunch to Sleigh Ride and Hot Chocolate (it’s a tea flavor! ), I’m so excited to have my seasonal tea of the day leading up to Christmas. 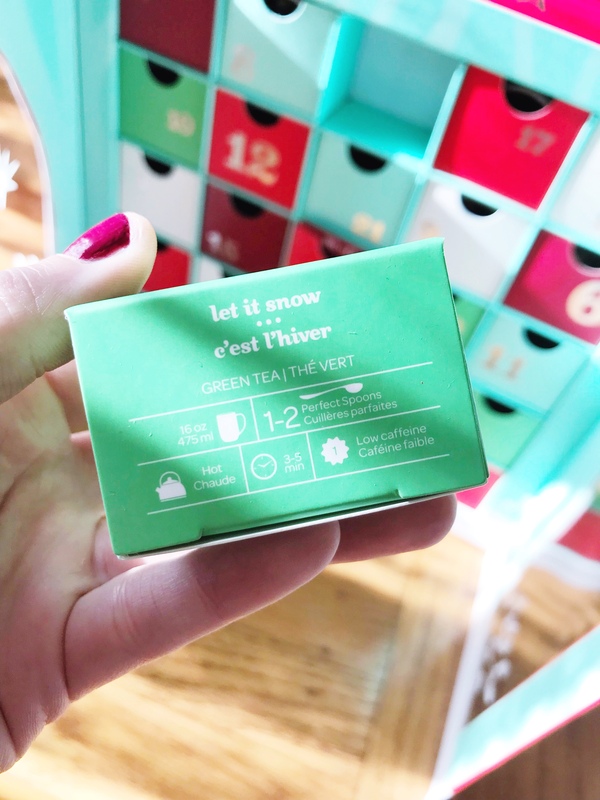 Before I get into the advent calendar (still have about three weeks of waiting for that), I’ll be drinking this “cinnamon, clove, and custard” green tea that tastes like wintry happiness with a touch of eggnog. I’ve had it hot but can’t wait to try it iced, too! I’ve been adding to my Christmas playlist thanks to the new album from Pentatonix. It’s a mix of classic favs and modern pop stuff, with favorites ranging from Mariah Carey and *NSYNC to Tony Bennett and Nat King Cole. There are even a couple songs from my grandpa in here! There’s something for everyone honestly. I stocked up on two 48oz units of Califia nog from Whole Foods because it’s SO GOOD. I love regular eggnog, but it sits in my stomach like a cement gut bomb after one sip. This stuff is lightened up, dairy-free, egg-free (hooray for my vegan and Jain friends! ), and tastes like wonderful holiday magic. 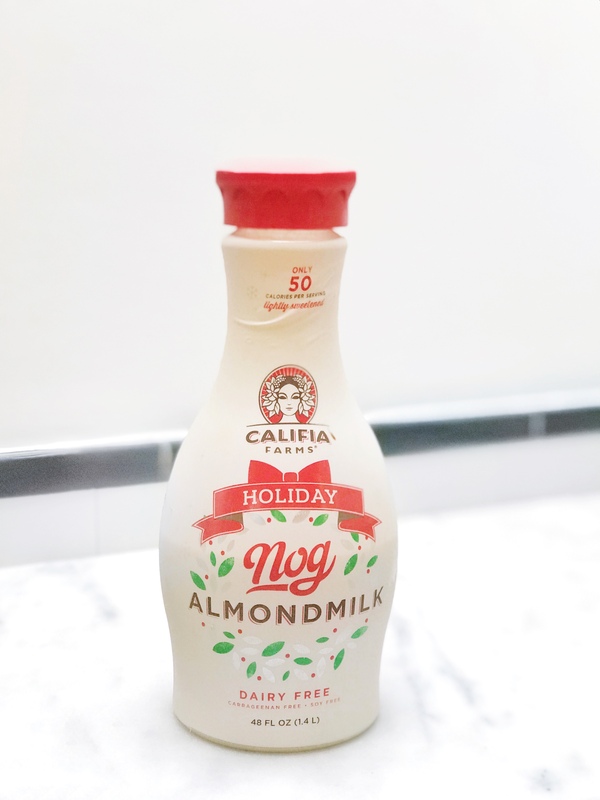 Also, I just got Califia’s mint cocoa creamer and I’m psyched to make dairy-free peppermint mochas. Will be keeping my eyes peeled for their Mexican mocha flav. If you want something that tastes decidedly holiday without being cloying or cliché, then this is the drink for you. 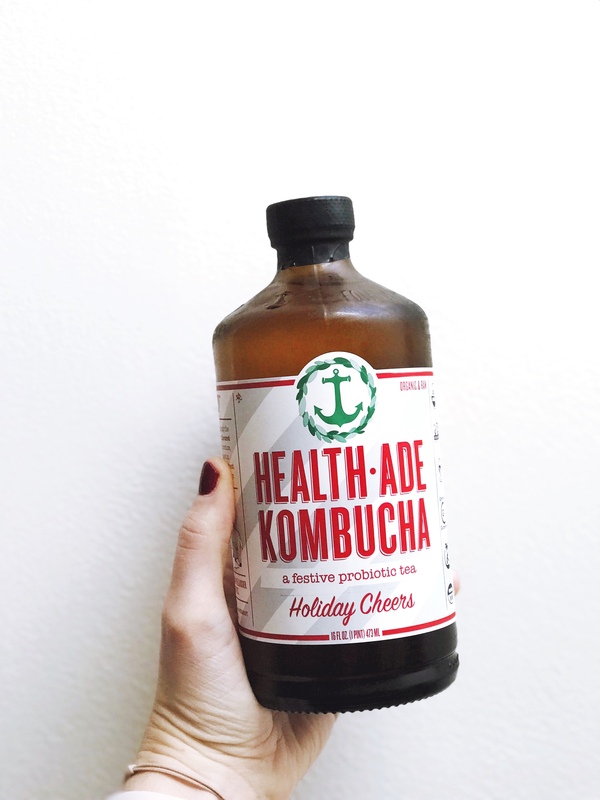 Spice up your kombucha with a little ginger, clove, allspice and the tiniest hint of chocolate. 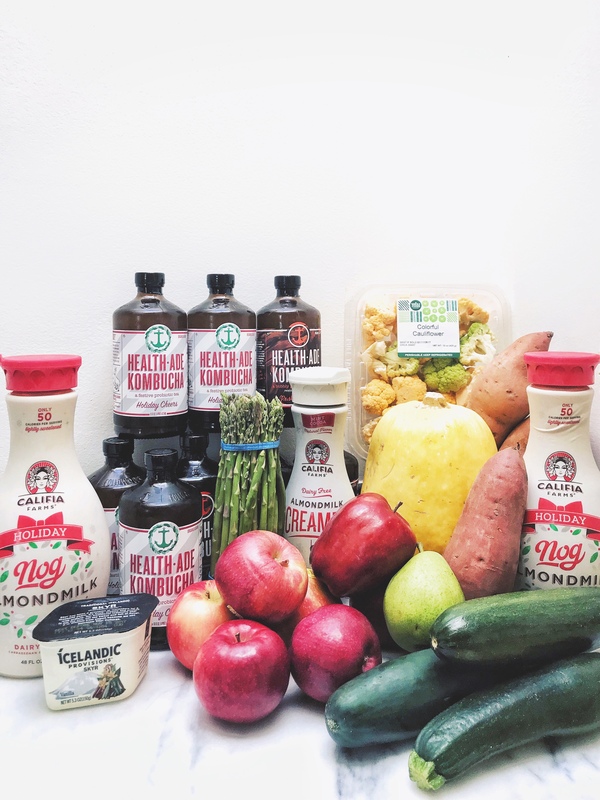 I also was just at Trader Joe’s and picked up a lightly gingered kombucha (tbh I got it because I thought it said gingerbread) and a cranberry apple spice kombucha… will report back. My favorite candle of all time is a Target exclusive with Yankee called Home For Christmas. I haven’t seen it back on shelves yet, so in the interim I’ve been burning Yankee Balsam & Cedar (that one’s on sale for stupid cheap) and Paddywax Cinnamon & Spice (yum) together to make the perfect blend of Christmas tree and holiday spice scents. 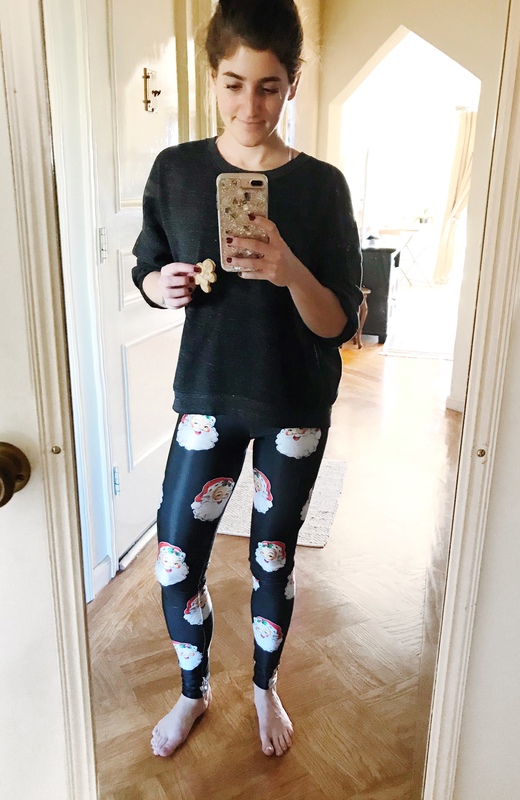 I’m not quite sure if there’s anything more me than these workout tights with a vintage santa face all over them. Also yes, I’m eating a mini gingerbread man from Trader Joe’s. The Goldsheep holiday lineup is FIRE you guys — if you love Christmas and exercise as much as I do, you’re gonna want a few pairs (at least). 99.999% of the time my nails are pastel or white. The rest of the year, they’re a deep berry, red, or metallic for the holidays. One of my favorite hues is this rich, creamy, opaque black cherry color that reminds me of pie, wine, and jam…. and obviously Christmas. As fate would have it, this 2014 Gwen Stefani Holiday Collection color (LOOOL) is no longer available, but this one is quite similar.